10) Be Creative! 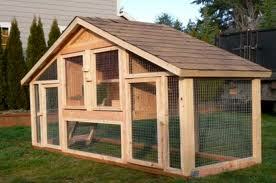 Your coop does not have to be an utilitarian eye sore. Quite the contrary, actually. Use your chicken coop as a prop for beautiful vegetation, potted plants and flowers. Just make sure they don’t contradict the needs of your chickens. This entry was posted on Friday, February 8th, 2019 at 10:44 am	and is filed under Articles, Chicks, News & Updates. You can follow any responses to this entry through the RSS 2.0 feed. Both comments and pings are currently closed.